We’ve come to this mutually acceptable agreement. D did try to confuse the matter by grabbing the pen and drawing beds and toilets and arrows in places they shouldn’t be, but I think we’ve managed to retain the essential messages. This entry was posted on Tuesday, September 11th, 2012 at 7:25 am and is filed under Uncategorized. 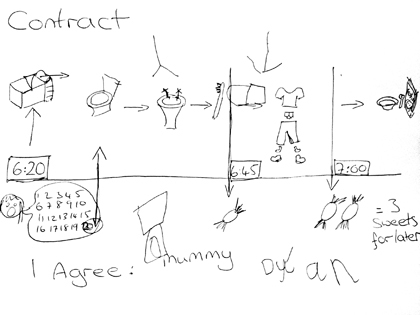 Tagged: agreement, children, contract, getting up, incentives, mornings, negotiation, rewards, routine, sweets. You can feed this entry. You can leave a response, or trackback from your own site.